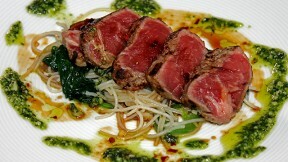 Spice up dinner by trying this Wagyu Tataki with Thai Basil Pesto and Spicy Rice Noodle Stir Fry recipe. This recipe comes from Simply Ming, hosted by award-winning chef Ming Tsai. Place rice noodles in a large bowl. Cover with hot tap water and soak for 20 minutes. Drain and set aside. In a large sauté pan over medium heat, add 2 tablespoons olive oil, shallots and jalapenos. Season with salt and pepper. Sauté to a golden color, constantly stirring, 3-4 minutes. Meanwhile, season four sides of meat with salt and white pepper. Roll in canola oil. Add 2 tablespoons garlic and scallions to pan with shallot mixture. Continue to cook over low heat to soften. Add Thai basil, cheese, remaining garlic, fish sauce to blender. On low speed, drizzle remaining olive oil in a stream. It will be a broken puree. Set aside. Add noodles to shalIot-garlic mixture. Cook for 2 minutes to heat through. Add spinach leaves and cook until wilted. Place the beef on hot skillet and sear on all 4 sides, roughly 8 seconds per side. Rest on cutting board 2 minutes. Slice into 1/4" pieces. In a small bowl, mix together the soy sauce, brown sugar and sambal until all sugar has all dissolved. Set aside. To plate, place mound of noodle mixture in center, place pieces of beef on top. Spoon pesto around plate. Drizzle soy-sambal syrup over meat and also around plate. Serve immediately.